One of the most important things we can do as leaders is to create a safe environment where our team members know that they can make mistakes. 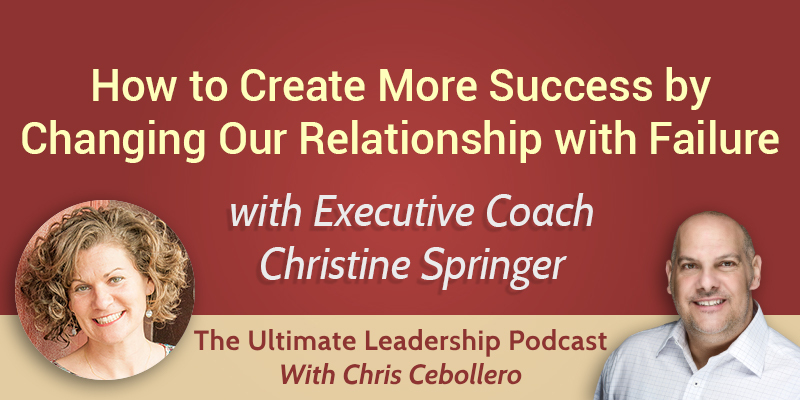 My guest today is executive coach Christine Springer, here to share with us her expertise on how to build resilience and self-compassion. Being resilient is having the ability to handle change and setbacks. You use those setbacks and failure to actually come back stronger. Why does adversity keep us from moving forward? What are we afraid of? The number one reason why people struggle to be resilient is that we judge ourselves. We take it personally. We sometimes mix up taking responsibility with beating ourselves up. When we are young, we figure out the best way to survive in our environment. Many of us grew up with teachers or parents judging us. One of the most important things we do as adults is learning how to shift the survival strategies we adopted as kids to strategies that can actually make us thrive. The way we can help kids and team members is to make them feel safe when they make mistakes. The first biggest myth about resilience is that if you are resilient, you’re going to be immune to feeling disappointment about the setback or the failure. When we feel disappointed about that, you start beating yourself up about feeling disappointed. The second biggest myth about resilience is the belief that you either are resilient, or you are not. Also, that if you are not resilient, that you cannot develop it. That’s not true. You need to have the desire to build resilience and to keep practicing. It’s important to allow yourself to feel whatever you’re feeling whether it’s disappointment or frustration. You have to actually feel it. Your body will store any emotion that you don’t allow yourself to feel fully and let go of. You need to be able to develop a personal relationship with each of your team members. Develop a plan together of what success looks like. People with a fixed mindset tend to be less resilient because they take failure very personally. People with a growth mindset are almost kind of curious about failure. They are energized by the idea of solving a puzzle. The first step to take in order to build resilience is to recognize the three habits that make us not resilient: perfectionism, personalizing feedback, and persevering on mistakes. When we’re mindful of these tendencies, we can catch ourselves before they sabotage us later on in the game. Shift from the three Ps to the three Cs: compassion, curiosity, and confidence.